The Bridges Golf Club winds throughout The Bridges at Preston Crossings. Our Gunter golf course is a magnificent 18-hole Jeffrey Brauer Design and Fred Couples Signature Golf Course. We’re a proud part of the Dallas golf community. In the creation of this spectacular course, former Masters Champion, Fred Couples, has drawn on his vast experience with the most challenging courses worldwide. 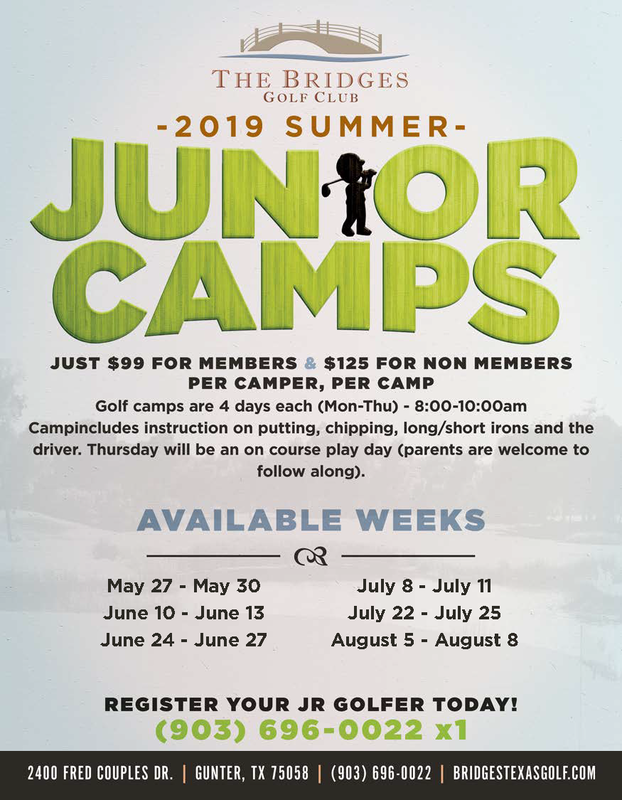 The result is a world-class Gunter and Dallas golf experience for the beginner or the expert! Our idyllic Dallas metroplex golf setting will let you step away from life for a little while and focus on your golf passion. Our professionally engineered course will challenge you to decrease your score on our fairways, numerous water hazards, and tactically placed sand traps. Most people who play our course like it so much, they book their next tee time after their round of golf. When you come play the Bridges Golf Club, you will thoroughly love our professionally kept facilities. Our Pro Shop has much of the most recent gear at fantastic prices; some of the best in all of the Dallas golf world. We even have a delicious restaurant for you golfers who want to grab a bite before or after your exciting round of golf. If you have been wanting to perfect a part of your golf technique, come practice on our driving range with one of our golf pro’s. Bridges Golf Club has an eager staff that is committed to providing you with customer service that will make your golf visit wonderful.